The Indian Navy's INS Talwar. 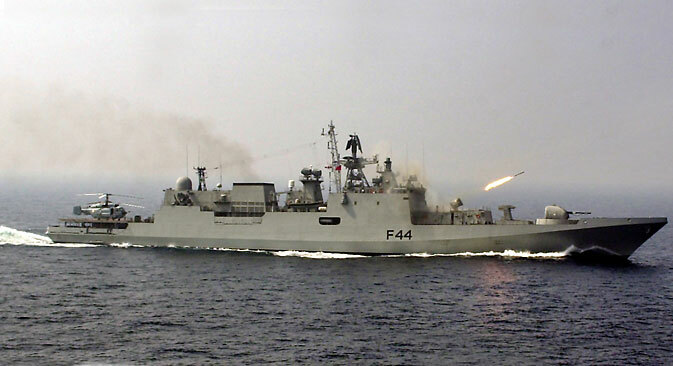 Media has learned about frigates intended for the Black Sea Fleet being sold to India. Moscow and New Delhi have reached an agreement for the sale to India of three patrol ships of the Project 11356 Class (according to Western classification – Admiral Grigorovich class frigate), intended for the Russian Black Sea Fleet. This was reported on Thursday, August 4 by the authoritative military publication Jane’s Defence Weekly, citing a source in the Russian defense industry. “The appropriate secret agreement was signed, India will receive three Project 11356 frigates that are currently being built. The Indian side will also be given 12 sets of spare parts for these vessels,” said the source. The price of the transaction was not disclosed. The main problem, according to the newspaper, is the question of power to be used on the ships, which were designed to use Zorya-Mashproekt gas turbine engines, made by Ukrainian enterprises, the cooperation with which has been terminated in connection with a break in military-technical relations with Ukraine in 2014. Currently, all three remain unfinished, waiting for propulsion units. According to Jane’s sources, India can get the previously purchased by Russia, but undelivered engines, or else buy new power plants directly from Ukraine. In addition, Moscow and New Delhi are considering transporting the hulls of the frigates, currently located at the Yantar Shipyards in Kaliningrad Oblast, to India for their completion and the installation of engines. It is assumed that the three frigates, now called the Admiral Butakov, Admiral Istomin and Admiral Kornilov, will be armed with Indian Brahmos cruise missiles. Far sea patrol ships (frigates) of the Project 11356 Class, designed by the Severnoye Design Bureau, are the improved models of the Talwar Class export frigates built in Russia for the Indian Navy.